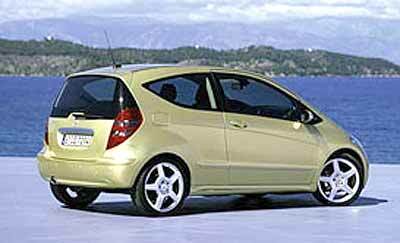 If you think this looks a lot like the Toyota Yaris, then you are certainly correct. This new car was shown at the Paris motor show and was called the Auris, but motor industry insiders say that name will be dropped when it comes into production, and it will be the 10th generation Toyota Corolla. The production version will be shown at the Geneva Show next March, and if we are very lucky (I stress “very”) we could even see this Corolla at our Bangkok International Motor Show at the end of March – beginning of April 2007. It was designed at Toyota’s ED2 design centre in Toulouse in Southern France, where the Yaris was designed, which goes a long way towards explaining the ‘family’ look. Both cars share similar styles in the front end, silhouette and tail treatment. Mind you, both of them have design influences from the Mercedes Benz A180, which has been released for a couple of years. Those who have seen it at the Paris show say that Germanic and even Honda Europe influences surface in the interior, which are dominated by a high-set center console and gear-shift, and a very VW-like central information screen. 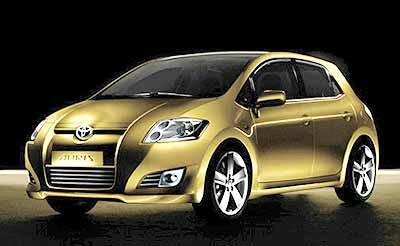 Toyota will not disclose information other than length (4226 mm), width (1762 mm) and height (1530 mm) for the new hatchback, however speculation is rife that the Auris’ four-cylinder engines and running gear are derived from the Corolla Verso II, a five and seven seat MPV which is sold in Europe and also built at their Turkish plant. Released during 2004, Corolla Verso II has two VVT-i variable-valve four cylinder petrol engines, in 81 kW/150 Nm 1.6 and 95 kW/170 Nm 1.8 liter formats, as well as two 2.2 liter D4D direct-injection common rail turbo-diesel units (100 kW/310Nm and high-tune 130 kW/400 Nm). With the incredible range of models that Toyota has world-wide and a marketing strategy designed to get its models out there into the marketplace as soon as possible, this new Corolla will be another nail in the coffin of GM, currently hanging on as number 1 in total sales – but not for long. Toyota has already deposed Ford from the second position. Last week I mentioned Jaguar and asked why was there no Mk IV? This produced the usual cry of “Yes there was, it came out before the Mk V, and could be had in various engine forms, sedan and drophead coupe.” Unfortunately, whilst there was a Mk V, the model before it was never called the Mk IV by the factory. It was just a Jaguar 1.5, 2.5 or 3.5. Honest! So to this week. Four wheel drive has been used on racing cars over the years, I even saw the Ferguson 4WD racing with Graham Hill at the wheel. However, this question has nothing to do with the Ferguson. The first 4WD that was designed for racing was constructed in 1901, but it never actually raced. I want to know the make. Here’s a hint. The name is still around today!